This name uses Spanish naming customs: the first or paternal family name is Horford and the second or maternal family name is Reynoso. Alfred Joel Horford Reynoso (born June 3, 1986) is a Dominican professional basketball player for the Boston Celtics of the National Basketball Association (NBA). He played college basketball for the University of Florida, and was the starting center on the Gators teams that won back-to-back NCAA national championships in 2006 and 2007. He was drafted with the third overall pick in the 2007 NBA draft by the Atlanta Hawks, a team he played nine seasons with before joining the Celtics in 2016. He is a five-time NBA All-Star. He also represents the Dominican Republic national team. Horford was born in Puerto Plata, Dominican Republic. His father, Tito Horford, played three years in the NBA and several more overseas. In the summer of 2000, Horford and his family moved to Lansing, Michigan, where he attended Grand Ledge High School in Grand Ledge, Michigan, and was a star on its basketball team. Horford holds seven school records, including most career points (1,239). As a senior, he was named Class A Player of the Year after averaging 21 points, 13 rebounds and five blocks per game. While at Grand Ledge, Horford played AAU basketball for the Michigan Mustangs, who were runners-up in the Adidas Big Time National Tournament. Considered a four-star recruit by Rivals.com, Horford was listed as the No. 7 power forward and the No. 36 player in the nation in 2004. Horford accepted an athletic scholarship to attend Florida, where he played for coach Billy Donovan and teamed up alongside Joakim Noah, Corey Brewer and Taurean Green. He made an immediate impact as a Gator in 2004–05, starting at center in the front court with David Lee, and helped the Gators win the 2005 Southeastern Conference Tournament championship. The Gators surged through the 2005–06 season, winning the SEC championship for a second straight year. They entered the 2006 NCAA Tournament as the No. 3 seed. The Gators swept through the first four rounds to reach the Final Four. There they defeated George Mason to reach the final. In the final, they defeated UCLA for the 2006 championship behind Horford's 14 points and seven rebounds. In December 2006, midway through his junior year, Horford missed a series of games due to injury. Coach Donovan held him out of a game against Stetson in hopes that he would be adequately healed for a game in Gainesville against the third-ranked Ohio State Buckeyes on December 23. One day before the game, Donovan announced that Horford would be unable to play, but Horford entered the game from the bench to guard Ohio State player Greg Oden, a highly touted 7'0" freshman. Oden scored just seven points, well below his season average of 15. Horford scored 11 points and added 11 rebounds in limited action, as the Gators defeated the Buckeyes. 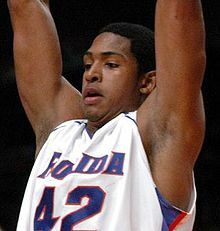 In the final home game of the season, on March 4, 2007 against Kentucky, Horford became the fourth player on his team to score 1,000 career points. He required 14 points during the game to reach the milestone, and scored exactly 14. On April 2, 2007, the Gators became the first team to repeat as national champions since the 1991–92 Duke Blue Devils, and the first ever to do so with the same starting lineup. Three days later, Horford, Joakim Noah, Corey Brewer and Taurean Green all declared for the NBA draft. On June 28, 2007, Horford was selected by the Atlanta Hawks with the third overall pick in the 2007 NBA draft. On July 9, he signed his rookie scale contract with the Hawks. As a rookie in 2007–08, Horford was the only player unanimously selected to the NBA All-Rookie First Team; he was also runner-up for Rookie of the Year honors and was named Rookie of the Month on four separate occasions. He became the first Atlanta draftee to earn first team honors since Stacey Augmon in 1991–92. Horford averaged 10.1 points, 9.7 rebounds, 1.5 assists, 0.9 blocks, 0.7 steals and 31.4 minutes in 81 games (77 starts). The Hawks finished the regular season with a 37–45 record and entered the playoffs as the eighth seed in the Eastern Conference. In their first round match-up with the Boston Celtics, Horford helped the Hawks take the eventual champions to seven games, losing the series 4–3. In the series, Horford averaged 12.6 points and 10.4 rebounds per game. In 2008–09, Horford started all 67 games he played in, averaging 11.5 points, 9.3 rebounds, 2.4 assists, 1.4 blocks and 0.8 steals in 33.5 minutes. With a 47–35 record, the Hawks entered the playoffs as the fourth seed in the East. Horford helped the Hawks advance to the second round where they were swept by the Cleveland Cavaliers; Horford missed Game 2 of the series due to injury. Horford had an outstanding season in 2009–10, becoming the first Hawks draft pick to earn an All-Star berth since Kevin Willis did so in 1992. Horford contributed 14.2 points, 9.9 rebounds, 2.3 assists, 1.1 blocks and 0.7 steals in 35.1 minutes (.551 FG%, .789 FT%), appearing in 81 games. He ranked eighth in the NBA in field goal percentage, 10th in rebounds, tied for ninth in offensive rebounds (2.9), and 26th in blocks. He had a team-leading 39 double-doubles, which was tied for 11th in the NBA. Playing alongside Mike Bibby, Jamal Crawford, Joe Johnson, Josh Smith and Marvin Williams, the Hawks entered the playoffs as the third seed in the East with a 53–29. However, the team failed to get past the second round for a second straight year, getting swept again, this time by the Orlando Magic. On November 1, 2010, Horford signed a five-year, $60 million contract extension with the Hawks. 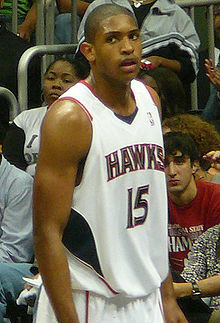 During the 2011 NBA All-Star Weekend, Horford was an All-Star for the second straight year, and he was also a member of the Atlanta team that won the Shooting Stars Competition. In 77 games in 2010–11, he posted averages of 15.3 points, 9.3 rebounds, 3.5 assists, 1.0 blocks and 0.8 steals (.557 FG%, .500 3FG%, .798 FT%). He ranked fifth in the NBA in field goal percentage, 28th in blocks and 16th in efficiency (22.5). He was also one of the top all-around rebounders in the league, finishing 11th in rebounds, seventh in defensive rebounds (7.0) and tied for 24th in offensive rebounds (2.4). He had 36 double-doubles (tied for ninth in NBA), including one 20/20 game. He was named Third-Team All-NBA. With a 44–38 record, the Hawks entered the playoffs as the fifth seed in the East. They made it through to the second round again, this time losing 4–2 to the Chicago Bulls. Due to the 2011 NBA lockout, the 2011–12 season did not begin until December 25, 2011. Horford appeared in the Hawks' first 11 games of the season before missing the final 55 due to a torn left pectoral muscle, an injury suffered on January 11, 2012 against the Indiana Pacers. On January 17, he underwent surgery to repair the muscle and was ruled out for three-to-four months. With a 40–26 record, the Hawks entered the playoffs as the fifth seed in the East. Horford missed an additional three playoff games before returning to action in Game 4 of the Hawks' first round series against the Boston Celtics. He played out the series, a series the Hawks lost 4–2. In 2012–13, Horford started all 74 games he played in, averaging a career-high 17.4 points, career-high 10.2 rebounds, 3.2 assists, 1.1 blocks and 1.1 steals in 37.2 minutes. He recorded 43 double-doubles (20 20-point/10-rebound games), including one point/assist. He scored 20-plus points in nine consecutive games (February 11 – March 3) for the first time in his career. On November 26, 2012, he was named Eastern Conference Player of the Week for the first time in his career. On February 27, 2013, he scored a career-high 34 points in a 102–91 win over the Utah Jazz. With a 44–38 record, the Hawks entered the playoffs as the sixth seed in the East. In their first round match-up against the Indiana Pacers, the Hawks were defeated 4–2 despite a playoff career-high 16.7 points per game from Horford over the six games. Over the first 29 games of the 2013–14 season, Horford posted nine double-doubles and scored in double-figures 28 times, including 13 20-point outings and one 30-point game. Over this stretch, he averaged a career-best 18.6 points per game. However, another shoulder injury suffered on December 26, 2013 sidelined him for the rest of the season. Initially considered a "bruised right shoulder", the injury turned out to be a complete tear of his right pectoral muscle, and required season-ending surgery. He did not play in the postseason, where the Hawks lost in the first round to the Indiana Pacers. In 2014–15, Horford played in 76 regular season games, the most since the 2010–11 season. On December 22, 2014, he was named Eastern Conference Player of the Week for games played Monday, December 15 through Sunday, December 21. He earned the award for just the second time in his career. On January 13, 2015, he recorded his first career triple-double with 21 points, 10 rebounds and 10 assists in a 105–87 win over the Philadelphia 76ers. Six days later, he was named Eastern Conference Player of the Week for games played Monday, January 12 through Sunday, January 18. On January 29, he earned his third All-Star nod as a reserve for the Eastern Conference in the 2015 NBA All-Star Game. In a brilliant stretch of play from December 7 to January 31, Horford scored in double digits in 28 consecutive games. Between December and January, the Hawks went 28–2 and had a franchise-best 19 game winning streak. Behind Horford and fellow All-Star teammates Paul Millsap, Kyle Korver and Jeff Teague, the Hawks finished the regular season with the best record in the East at 60–22, and advanced through to the Eastern Conference Finals for the first time in franchise history. There they were defeated by the Cleveland Cavaliers in four games. In 2015–16, Horford played in all 82 regular season games for the first time in his career. On November 11, 2015, he scored 26 points and made a career-high four three-pointers in a 106–98 win over the New Orleans Pelicans. On December 4, he scored 16 points against the Los Angeles Lakers to extend his streak of double-digit games to 22, setting a career high. His streak came to an end at 23 after scoring nine points against the Oklahoma City Thunder in the Hawks' 24th game of the season on December 10. On February 12, 2016, Horford was named to replace the injured Chris Bosh on the 2016 Eastern Conference All-Star team, thus marking his fourth All-Star selection. On February 28, he recorded his 200th career double-double with 13 points and 16 rebounds in an 87–76 win over the Charlotte Hornets. With a 48–34 record, the Hawks entered the playoffs as the fourth seed in the East. They advanced through to the second round where they were swept by the Cleveland Cavaliers for the second straight year. On July 1, 2016, Horford became an unrestricted free agent. The Hawks were optimistic they could reach a new deal with Horford, but after the team committed much of their salary cap to pick up Dwight Howard, it would have taken a max offer to land Horford. Horford signed a four-year, $113 million contract with the Boston Celtics on July 8, and said he was looking forward to working with Celtics head coach Brad Stevens and the rest of the team to bring a championship trophy back to Boston. He made his debut for the Celtics in their season opener on October 26, 2016, scoring 11 points in a 122–117 win over the Brooklyn Nets. He appeared in the team's first three games of the season, but then missed nine straight games with a concussion. He returned to action on November 19 and had 18 points and 11 rebounds in a 94–92 win over the Detroit Pistons. On March 19, 2017, he scored a season-high 27 points in a 105–99 loss to the Philadelphia 76ers. In Game 1 of the Celtics' second-round playoff series against the Washington Wizards, Horford nearly had a triple-double with 21 points, 10 rebounds and nine assists in a 123–111 win. The Celtics went on to reach the Eastern Conference Finals, where they were defeated 4–3 by the Cleveland Cavaliers. On November 12, 2017, Horford returned from a two-game absence with a concussion and scored 21 points on 8-of-9 shooting to help the Celtics hang on to beat the Toronto Raptors 95–94 for their 12th straight victory. On December 2, he recorded 14 points and a career-best 11 assists in a 116–111 win over the Phoenix Suns. Two days later, he recorded 20 points, nine rebounds and eight assists in a 111–100 win over the Milwaukee Bucks. On February 4, 2018, he made a 15-foot fadeaway jumper at the buzzer to lift the Celtics to a 97–96 win over the Portland Trail Blazers, finishing with 22 points and 10 rebounds. In Game 1 of the Celtics' first-round playoff series against the Bucks, Horford had 24 points and 12 rebounds in a 113–107 overtime win. In Game 7, Horford had 26 points and eight rebounds in a 112–96 win over the Bucks. The Celtics went on to reach the Eastern Conference Finals, where they were defeated in seven games by the Cavaliers. On October 19, 2018, Horford had 14 points, 10 rebounds and nine assists in a 113–101 loss to the Raptors. In December, he missed seven games with a sore left knee. On December 29, he scored 18 points with a career high-tying five 3-pointers in a 112–103 win over the Memphis Grizzlies. On February 21, 2019, he recorded 21 points and a season-high 17 rebounds in a 98–97 loss to the Bucks. On April 1, he recorded his second career triple-double with 19 points, 11 rebounds and 10 assists in a 110–105 win over the Miami Heat. Horford has been a member of the Dominican Republic national basketball team since 2008. In 2011, he won a bronze medal at the FIBA Americas Championship, and earned All-Tournament Team honors. Horford's father, Tito Horford, also played basketball. Tito, whose father was a Bahamian immigrant, was recruited by Marian Christian High School in Houston and attended Louisiana State and Miami before being drafted in the second round of the 1988 NBA draft. He played three years in the NBA and several more overseas. His uncle, Kelly Horford, played at Florida Atlantic University in the early 1990s, while his brother, Jon Horford, played at Michigan and Florida. His mother's name is Arelis Reynoso, and he also has two sisters, Anna and Maria, and another younger brother, Josh. Horford married 2003 Miss Universe Amelia Vega in Santo Domingo on December 24, 2011. In February 2015 his son was born. Their daughter was born in November 2016. ^ "Al Horford". Rivals.com. Retrieved July 9, 2016. ^ "Gators clamp down on UCLA to win first NCAA title". ESPN. April 3, 2006. Retrieved July 9, 2016. ^ Brockway, Kevin (March 4, 2007). "UF rebounds with record win over Kentucky". Gainesville.com. Retrieved July 9, 2016. ^ Katz, Andy (April 5, 2007). "Florida's four juniors to enter NBA draft". ESPN. Retrieved July 9, 2016. ^ "Transactions: 2007-08 Season". NBA.com. Retrieved July 9, 2016. ^ a b c d e f "Al Horford Stats, Video, Bio, Profile". NBA.com. Retrieved July 9, 2016. ^ "Al Horford 2007-08 Game Log". Basketball-Reference.com. Retrieved July 9, 2016. ^ "Al Horford 2008-09 Game Log". Basketball-Reference.com. Retrieved July 9, 2016. ^ "Cavs remain unbeaten in 2009 playoffs behind James' 27 points in three quarters". ESPN. May 7, 2009. Retrieved July 9, 2016. ^ "Al Horford 2009-10 Game Log". Basketball-Reference.com. Retrieved July 9, 2016. ^ "Al Horford agrees to five-year, $60M extension with Hawks". USAToday.com. November 1, 2010. Retrieved July 9, 2016. ^ "Al Horford has successful surgery". ESPN. January 17, 2012. Retrieved July 9, 2016. ^ "Notebook: Celtics 101, Hawks 79". ESPN. May 6, 2012. Retrieved July 9, 2016. ^ "HORFORD WINS EASTERN PLAYER OF THE WEEK HONORS". NBA.com. November 26, 2012. Retrieved July 9, 2016. ^ "Notebook: Hawks 102, Jazz 91". NBA.com. February 27, 2012. Retrieved July 9, 2016. ^ "Al Horford 2012-13 Game Log". Basketball-Reference.com. Retrieved July 9, 2016. ^ "Notebook: Hawks 127, Cavs 125 2OT". NBA.com. December 26, 2013. Retrieved July 9, 2016. ^ "HAWKS INJURY REPORT – DECEMBER 27, 2013". NBA.com. December 27, 2013. Retrieved July 9, 2016. ^ "Hawks' Horford has season-ending surgery". NBA.com. December 31, 2013. Retrieved July 9, 2016. ^ "Horford, Aldridge named Players of the Week". NBA.com. December 22, 2014. Retrieved July 9, 2016. ^ "Hawks storm past 76ers 105-87 for 9th straight win". NBA.com. January 13, 2015. Retrieved July 9, 2016. ^ "Al Horford Named NBA Eastern Conference Player of the Week". NBA.com. January 19, 2015. Retrieved July 9, 2016. ^ "Al Horford, Paul Millsap and Jeff Teague Named Eastern Conference All-Stars". NBA.com. January 29, 2015. Retrieved January 29, 2015. ^ Broom, Joshua (September 23, 2015). "Atlanta Hawks Preview: Al Horford". SoaringDownSouth.com. Retrieved July 9, 2016. ^ "Pierce's shot too late, Hawks hold on to beat Wizards 94-91". NBA.com. May 15, 2015. Retrieved July 9, 2016. ^ "Horford, Millsap rally Hawks to 106-98 win over Pelicans". NBA.com. November 11, 2015. Retrieved November 11, 2015. ^ "Horford, Hawks spoil Bryant's last game in Atlanta". NBA.com. December 4, 2015. Retrieved December 4, 2015. ^ "Al Horford 2015-16 Game Log". Basketball-Reference.com. Retrieved July 9, 2016. ^ "Hawks' Horford replaces injured Bosh in All-Star Game". NBA.com. February 12, 2016. Retrieved February 12, 2016. ^ "Bazemore, Horford propel Hawks past Hornets". NBA.com. February 28, 2016. Retrieved February 28, 2016. ^ Snow, Taylor C. (July 8, 2016). "Celtics Welcome Al Horford to Boston". NBA.com. Retrieved July 8, 2016. ^ "Boston Celtics Sign Al Horford". NBA.com. July 8, 2016. Retrieved July 8, 2016. ^ Snow, Taylor C. (July 8, 2016). "Al Horford, Celtics agree on deal; agent says 4 years, $113 million". ESPN.com. Retrieved October 28, 2016. ^ "Thomas scores 25, Celtics fight off Nets 122-117". ESPN.com. October 26, 2016. Retrieved October 27, 2016. ^ "Thompson, Durant lead Warriors to 104-88 win over Celtics". ESPN.com. November 18, 2016. Retrieved November 20, 2016. ^ "Celtics win in Detroit on Horford's follow in final seconds". ESPN.com. November 19, 2016. Retrieved November 20, 2016. ^ "Philadelphia rallies from 13 down to beat Celtics 105-99". ESPN.com. March 19, 2017. Retrieved March 19, 2017. ^ "Thomas' 33, Celtics' 3s too much for Wizards in 123-111 win". ESPN.com. April 30, 2017. Retrieved April 30, 2017. ^ "Celtics hold off Raptors 95-94 for 12th straight victory". ESPN.com. November 12, 2017. Retrieved November 12, 2017. ^ "Irving scores 19 points as Celtics top Suns 116-111". ESPN.com. December 2, 2017. Retrieved December 2, 2017. ^ "Irving' 32 helps Celtics hold off Greek Freak, Bucks 111-100". ESPN.com. December 4, 2017. Retrieved December 4, 2017. ^ "Horford hits at buzzer, Celtics top Trail Blazers 97-96". ESPN.com. February 4, 2018. Retrieved February 4, 2018. ^ "Celtics survive wild finish, hold off Bucks 113-107 in OT". ESPN.com. April 15, 2018. Retrieved April 15, 2018. ^ "Celtics beat Bucks 112-96 in Game 7, advance to play 76ers". ESPN.com. April 28, 2018. Retrieved April 28, 2018. ^ "Kawhi Leonard scores 31 points, Raptors beat Celtics 113-101". ESPN.com. October 19, 2018. Retrieved October 19, 2018. ^ "Irving scores 25, Celtics beat Hornets 119-103 to end skid". ESPN.com. December 23, 2018. Retrieved December 24, 2018. ^ "Irving, Horford lead rally as Celtics beat Grizzlies 112-103". ESPN.com. December 29, 2018. Retrieved December 30, 2018. Horford's five 3-pointers matched his career high set against Houston on Dec. 29, 2015. ^ "Antetokounmpo scores 30 points, Bucks beat Celtics 98-97". ESPN.com. February 21, 2019. Retrieved February 22, 2019. ^ "Celtics spoil Wade's final Garden visit, beat Heat 110-105". ESPN.com. April 1, 2019. Retrieved April 2, 2019. It was Horford's second career triple-double and first as a Celtic. His first was Jan. 13, 2015, with Atlanta. ^ "Al Horford's profile". FIBA.com. Retrieved September 4, 2017. ^ Brubaker, Bill (October 12, 1986). "The Strange, Tangled Journey of Tito Horford, Basketball Star". LATimes.com. Retrieved July 9, 2016. ^ "Atlanta Hawks Player Preview: Al Horford". CBSLocal.com. October 26, 2013. Retrieved July 9, 2016. ^ Bowers, Rachel G. (July 2, 2016). "Meet Al Horford, the newest Celtic". BostonGlobe.com. Retrieved July 9, 2016. ^ Menze, David (February 24, 2015). "Al Horford and Wife Welcome First Child". SoaringDownSouth.com. Retrieved July 9, 2016. ^ Murphy, Mark (November 28, 2016). "Al Horford to miss tonight's Celtics game for birth of second child". BostonHerald.com. Retrieved November 29, 2016. ^ King, Jay (November 28, 2016). "CSNNE's Michael Felger believes Al Horford should have suited up for Boston Celtics despite birth of child". MassLive.com. Retrieved November 29, 2016. This page was last edited on 19 April 2019, at 19:35 (UTC).